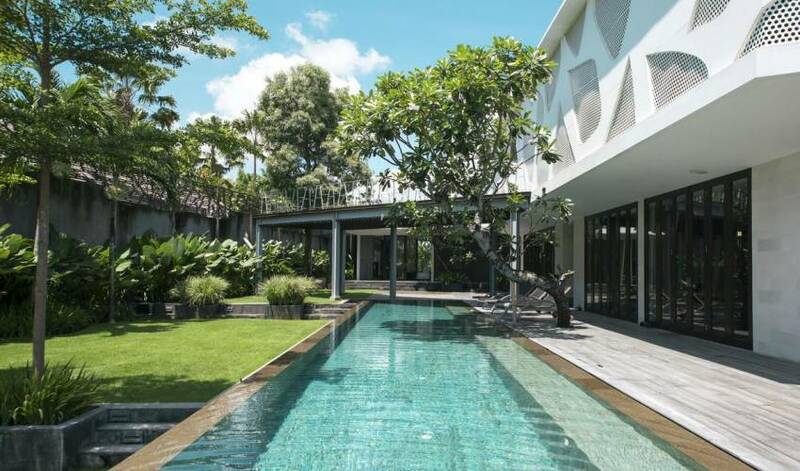 This super-stylish architectural masterpiece is nestled in a quiet cul-de-sac in the heart of Seminyak, a short stroll from the beach. 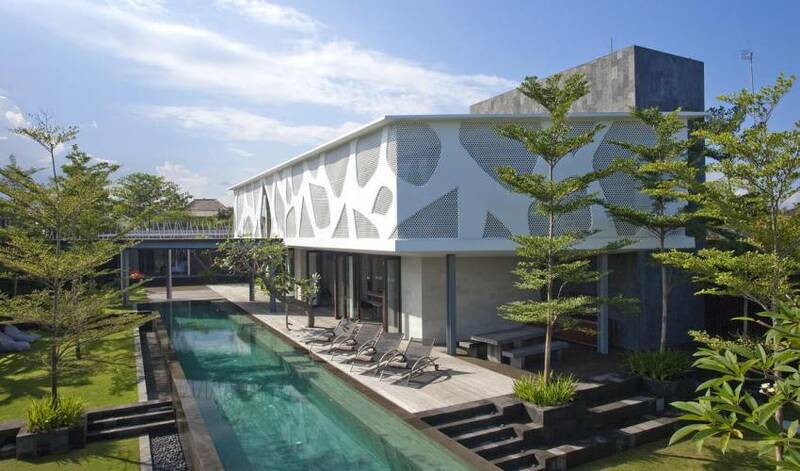 A stunning metal sculpture wraps around the luxury Seminyak Villa's top floor, providing practical shade and a delightful play of light in two of the villa’s four bedrooms. 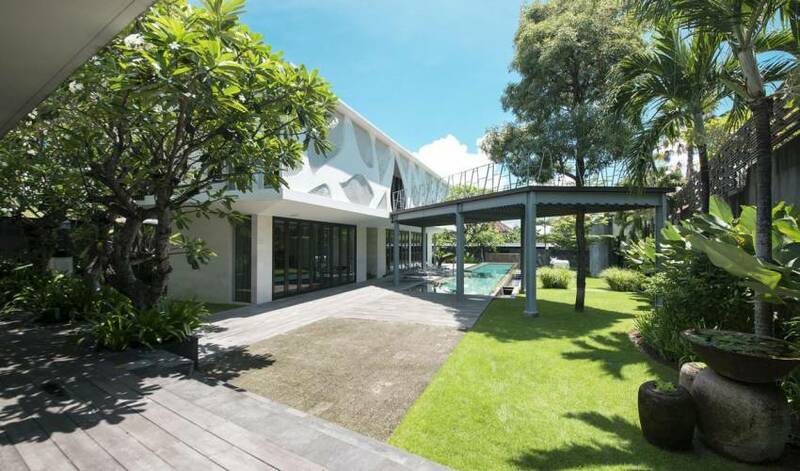 Two more bedrooms overlook the enticing 25-metre pool. 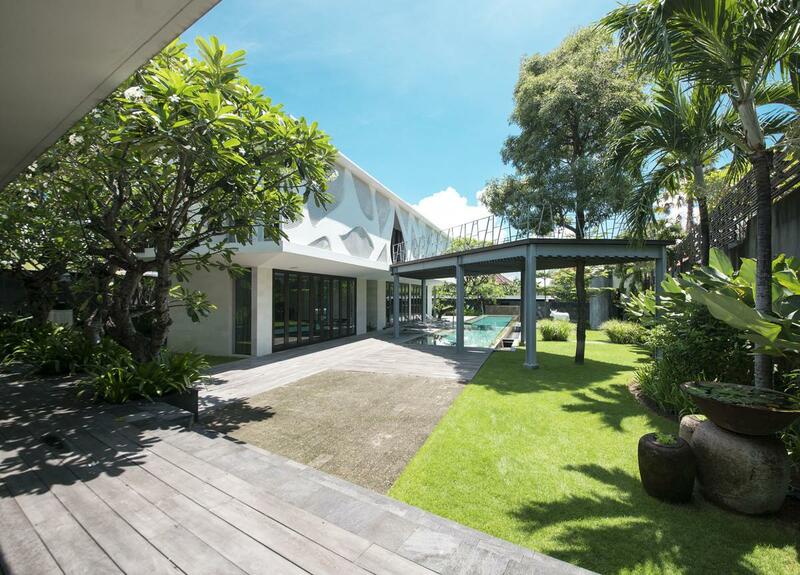 Living and dining spaces are chic, comfortable and flow freely to the garden. 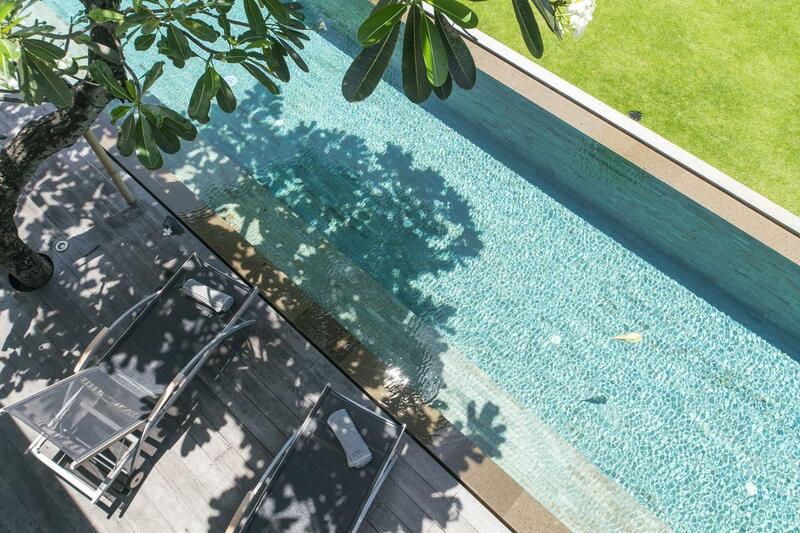 A covered barbecue dining area and timber ‘bridge’ deck above the pool provide stylish outdoor relaxation space, and the well-equipped gym is just the place to work off the spectacular meals cooked by your private chef, just one of the fantastic team of staff at the villa. A conversation about Villa wouldn’t be complete without mention of the innovative metal ‘skin’ that surrounds the two bedrooms on the top floor. Not only is it functional, providing shade and keeping the rooms incredibly cool, it is a piece of kinetic art in its own right, the travelling sun creating interesting shadows and casting soft, diffused light. 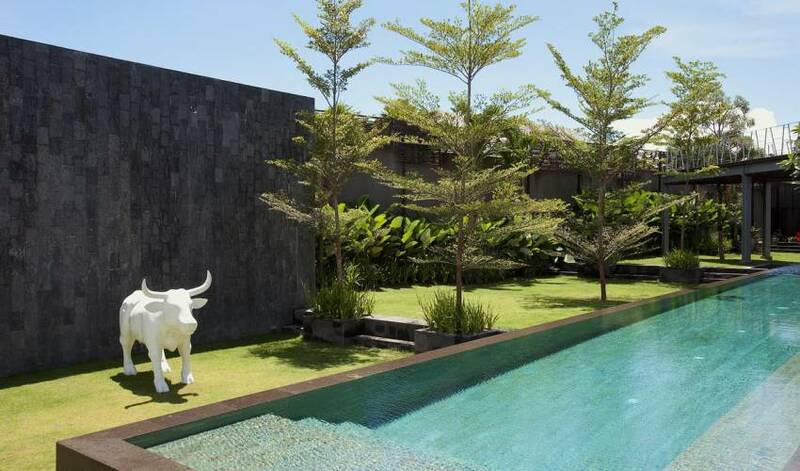 The villa overflows with aesthetic touches that infuse every stay with personal pleasure: the whimsical fibre-glass bull that takes pride of place in the garden, the unique artworks that have been specifically commissioned and the vibrant soft furnishings, designed and printed by the owners. You will also be looked after, 24 hours a day, by an incredible team of staff, including your highly trained private chef. 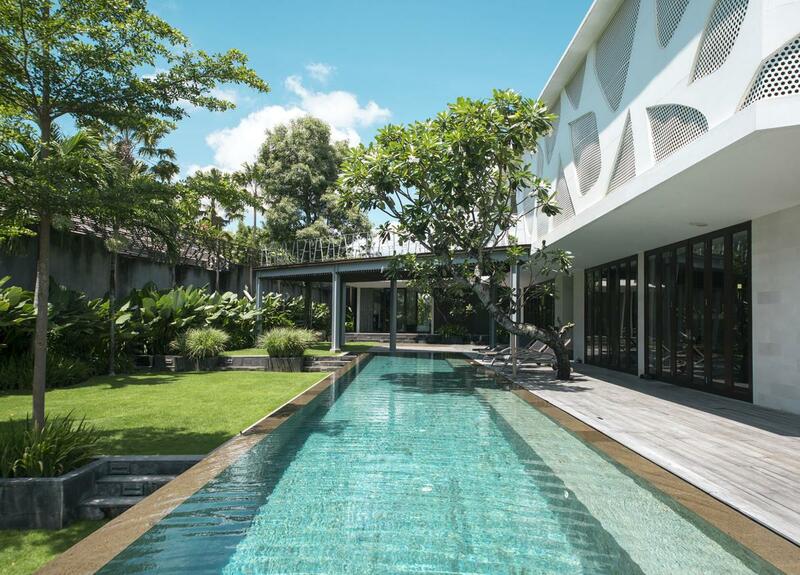 Stepping through the gate and into the villa’s serene garden, interest is immediately drawn to the striking white steel and wood screen that wraps the villa’s two upper-floor bedrooms and the timber ‘bridge’ that extends out over the pool. 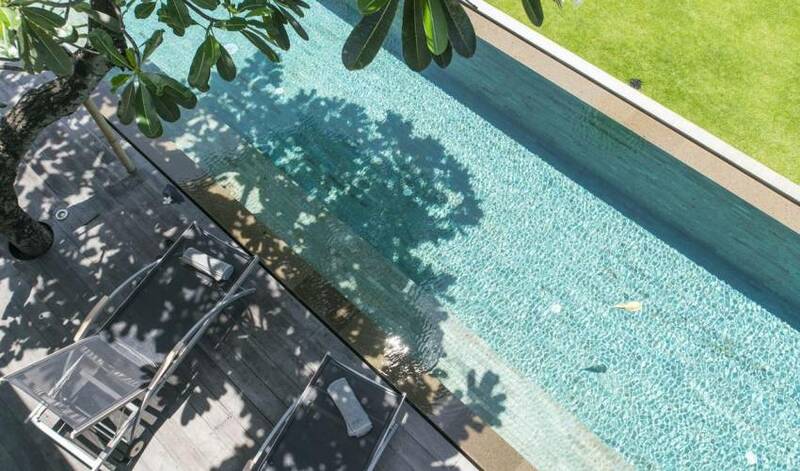 The ground floor of the villa comprises the chic contemporary lounge, dining room and kitchen, while outside, the barbecue dining area overlooks the 25-metre swimming pool, and a two-bedroom guest pavilion and stand-alone gym rest among the tropical plants and ancient frangipani trees. Kick back and relax on the sofas and ottomans in the villa’s stylish lounge. A fabulous zebra skin rug, bright cushions and quirky artworks decorate this comfortable, light and airy room which features a 55-inch satellite television, DVD player, iPod dock, and a Bose sound system that is wired to work throughout the building and can be controlled from each room. A sliding door separating the lounge from the dining area can be opened up to make one large open plan living space. The dining area has a blonde wood table with seating for ten and overlooks the state-of-the-art, stainless steel kitchen. The lounge, kitchen and dining area all have floor-to-ceiling glass doors, which can be opened or closed at your discretion. 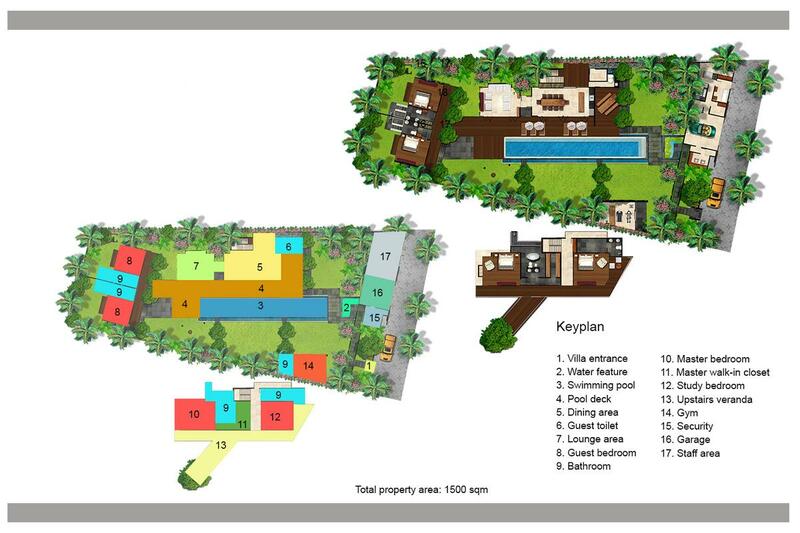 Bali’s climate lends itself to outdoor living and there are plenty of spaces to enjoy the tropical lifestyle at Villa. For relaxed dining look no further than the barbecue area in the garden with seating for eight and a top-of-the-range gas-fired barbecue. The ‘bridge’ deck above the pool is the perfect space to relax on a beanbag and read a magazine but when the sun goes down, this is a spectacular spot to enjoy a cocktail with friends. 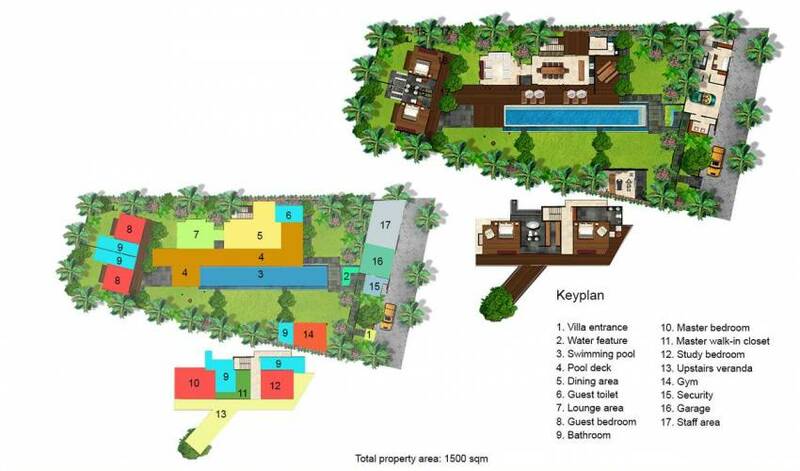 All the villa’s well-appointed bedrooms are air-conditioned and feature luxurious ensuite bathrooms, 32-inch television screens with DVD players and Bose surround-sound. Located on the upper floor of the main villa, the villa’s elegant master bedroom boasts recycled teak flooring and stunning black-and-white artwork. This king-bedded room has a large dressing area and its enormous grey terrazzo bathroom has a freestanding tub as well as indoor and outdoor rain showers. 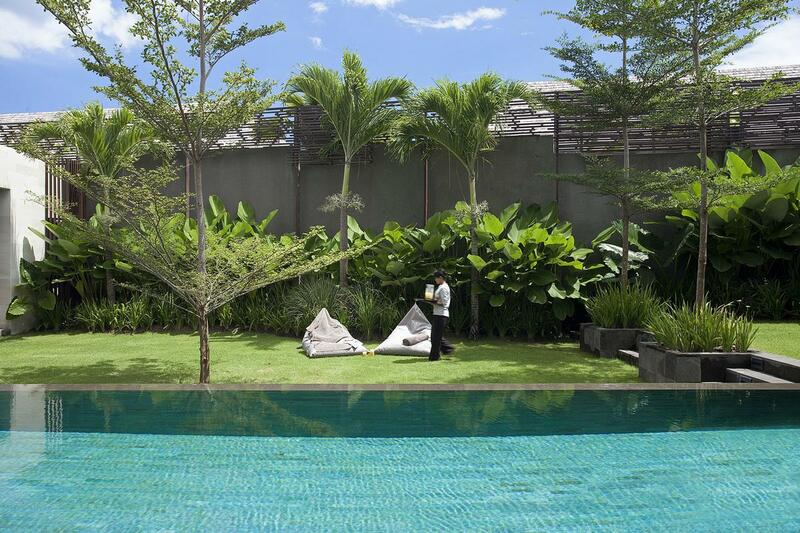 The villa’s guest pavilion is located in the garden and overlooks the pool. Its two identical bedrooms feature king-size beds, honey blonde teakwood floors and ensuite garden bathrooms with rain showers and romantic bathtubs for two. A terrace at the front of the bedrooms has a covered seating area furnished with beanbag chairs and daybeds, making this the perfect getaway spot. 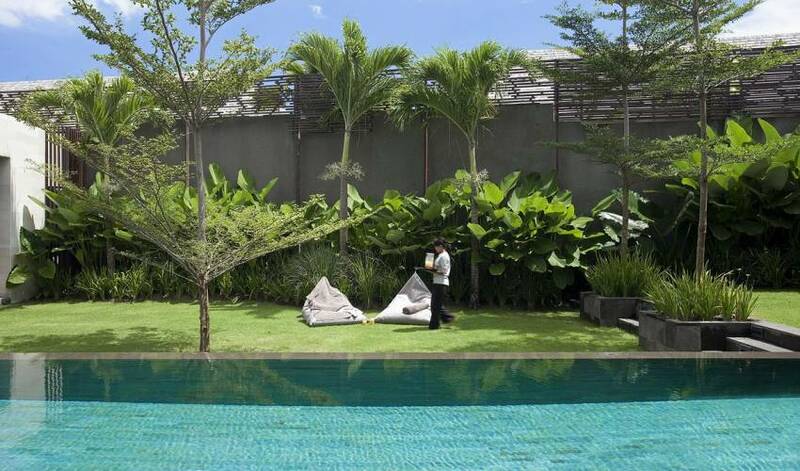 The Luxury Seminyak Villa is tucked down a quiet cul-de-sac in the heart of the city. 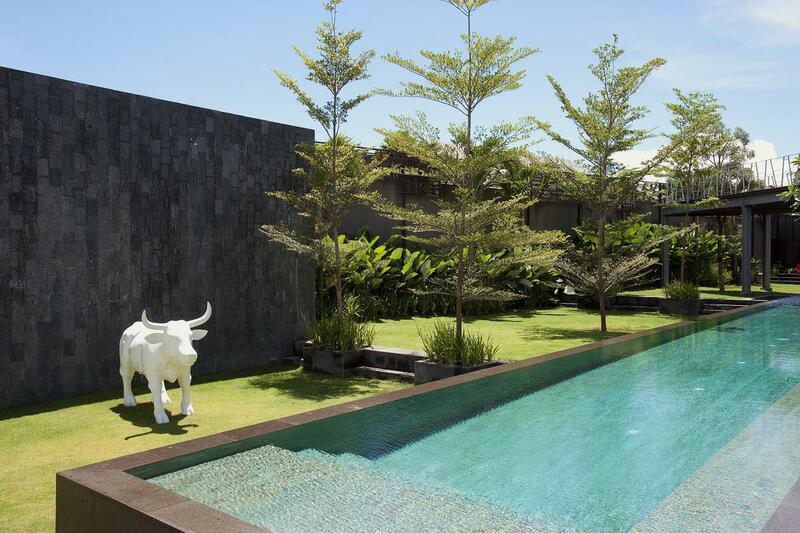 The villa is close to the Oberoi and Legian Hotels and is ideally situated for anyone wishing to sample Seminyak’s world-class dining, happening bars and fabulous clothing, homeware and jewellery boutiques. The famous beachfront dining venue, Ku De Ta, is just down the road and the beautiful seaside restaurant of La Lucciola only a short stroll away, as is Seminyak Beach and the sacred Petitenget Temple. Thank you very much for taking care of us . We had an amazing stay at villa Issi. The villa was stunning and clean and beautifully maintained. The staff were very friendly and eager to please and extremely professional. And Yuli you have been wonderful to deal with and very accomodating to us from start to finish. 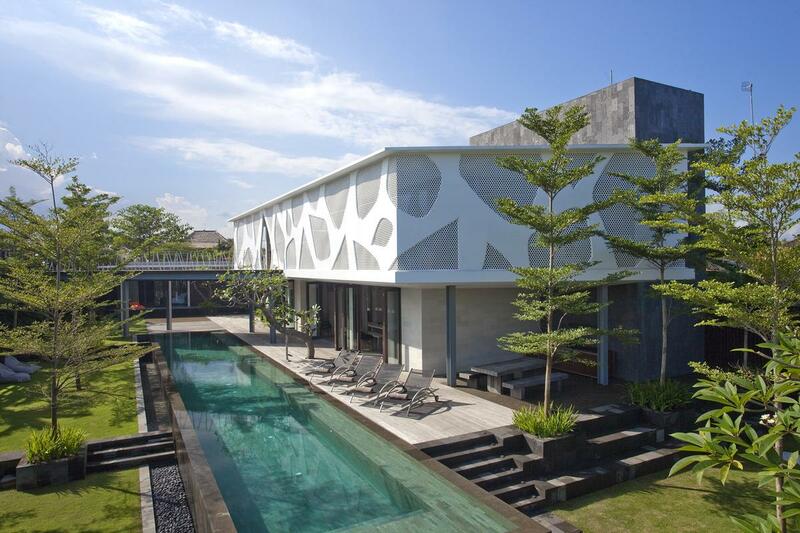 I would definitely stay at villa Issi again and have already recommended villa getaways to many people. I can’t speak highly enough of your company! !